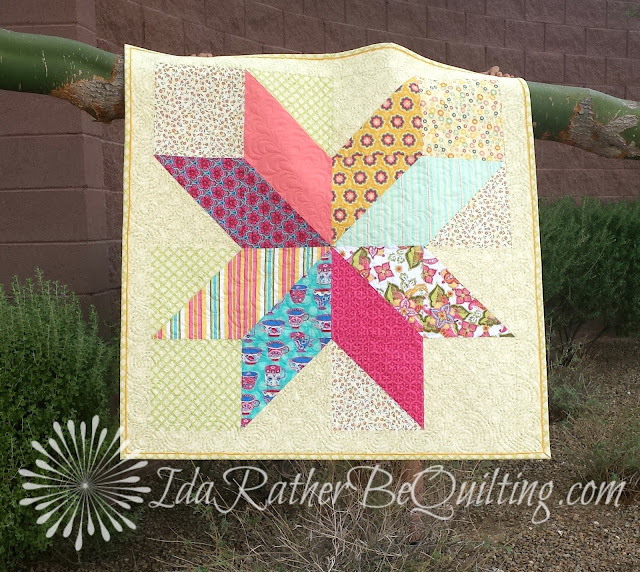 I love me some baby quilts! After minis, they are the near-instant gratification of quilting projects. 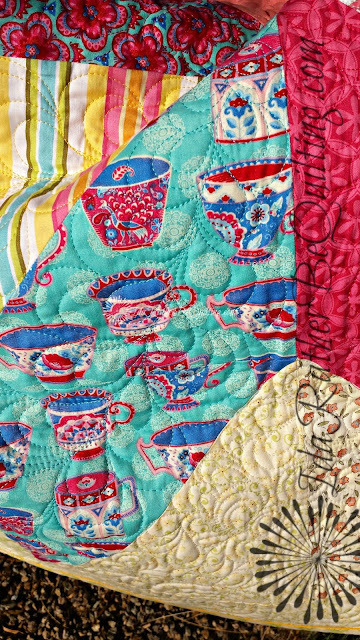 And this great pattern by Amy Smart of Diary of a Quilter is particularly quick and easy while still being absolutely adorable. Follow the link and check out Amy's two versions. They are darling! I was inspired to look through my own stash to find some fun brights and low volume sweetness to put together "Star Bright" for a friend's brand new baby girl. 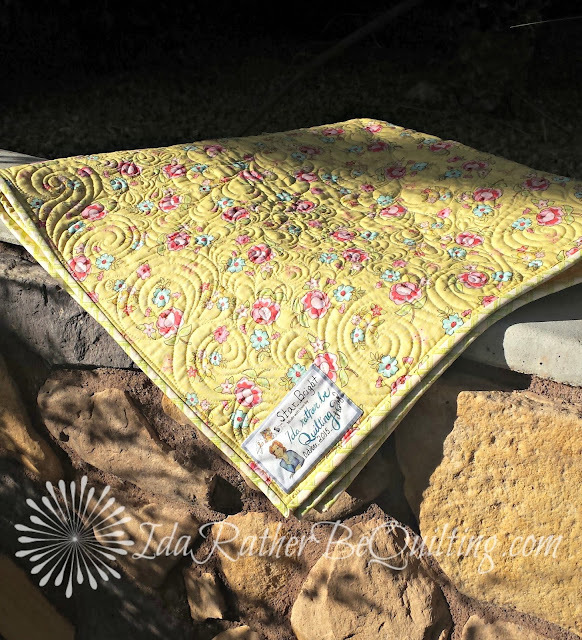 I also included a solid to give the eyes a place to rest and to showcase the quilting design. I stitched cowardly feathers (they're spineless) in each star point. A quilting tip - if you know one area of your quilt is going to show the quilting more than the rest - stitch that area last. It will give you a chance to practice and prefect the design in the less noticeable regions. The quilt finished at 41 inches square and was quilted with my favorite threads - Superior Threads Magnifico and Sew Fine. Can't beat that stuff! 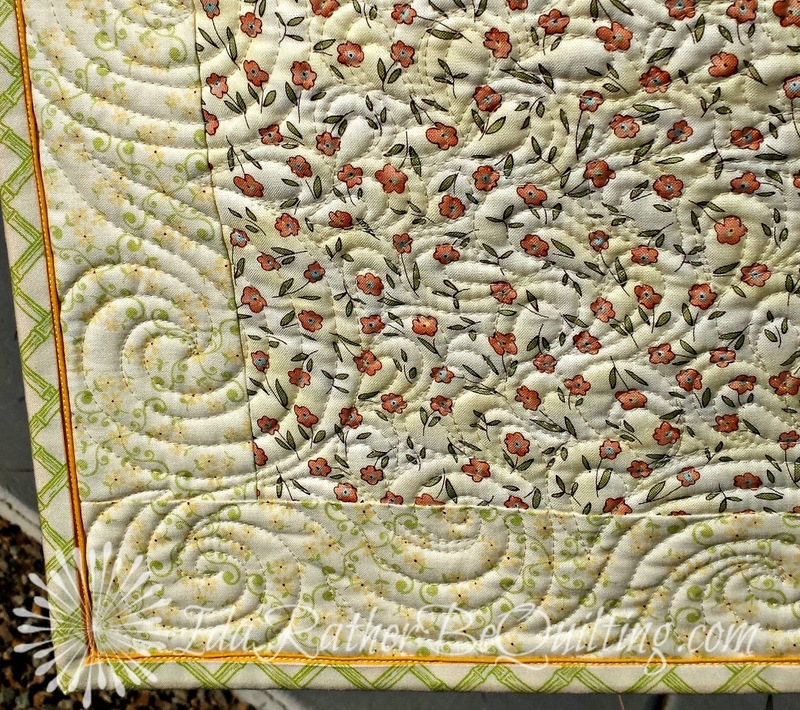 Two fun things here: my border was fairly narrow but I didn't let that stop me from quilting a much larger border swirl chain. Letting it spill into the center of the quilt worked because I had all low volume prints and the design was flexible enough to avoid quilting it on the star points. I also wanted just a wee bit of color to pop out of all that low volume background so I did a flange binding, also known as Susie's Magic Binding from 52 quilts in 52 weeks. It's a great way to machine bind (which I recommend on a baby quilt). 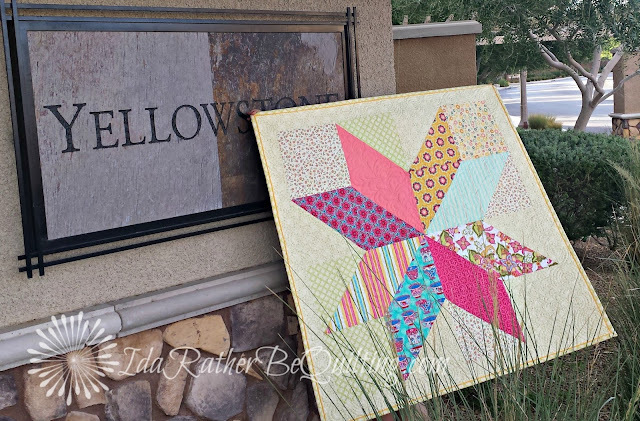 One last shot of my yellow star baby quilt. (I couldn't resist). Thanks for coming by today! Great tip about the quilting, I completely agree! Lovely finish, and I hope it is well used and loved. Great finish. I like the swirl FMQ. Oh that is a good tip about the quilting. I've never progressed much beyond swirls, but I have plans for some stylised waves in my next finish! Very nice. Great collection of fabrics. Your work is beautiful. Very nice quilt. This is a great pattern. I have one made that I just need to sew the binding on. That is certainly a great quilting tip that I definitely agree with. 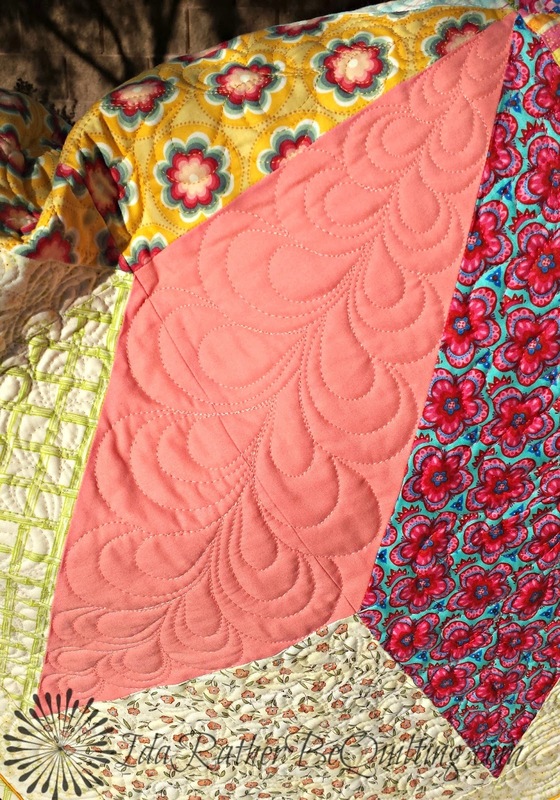 Love your feathers on this quilt. cowardly feathers ~ haha :D Great job! Great post. Thank you for the inspiration.